Racquel Writes: Hint Fiction Contest- Guest Judge, Joyce Carol Oates! Hint Fiction Contest- Guest Judge, Joyce Carol Oates! "The stories in this collection run the gamut from playful to tragic, candid to enigmatic, but they all have one thing in common: they are no more than 25 words long. Editor Robert Swartwood termed them "hint fiction" because the few chosen words suggest a larger, more complex chain of events. The 125 gemlike stories in this collection come from such notable contributors as Joyce Carol Oates, Ha Jin, Peter Straub, and James Frey, as well as emerging writers." REWIND. Did they just say Joyce Carol Oates? As you all know she is my writer idol, and one of my favorite past times is stalking her, though it's difficult since she doesn't have a twitter. (JCO if you're reading this, get on twitter!) After reading that her work was included in the anthology, I marched straight up to the register and purchased the book. Also on the back cover was the website for the editor, Robert Swartwood. I decided to check it out because I had to know more about hint fiction. Something about very short fiction just fascinates me. "Hint Fiction (n): a story of 25 words of fewer that suggests a larger, more complex story." 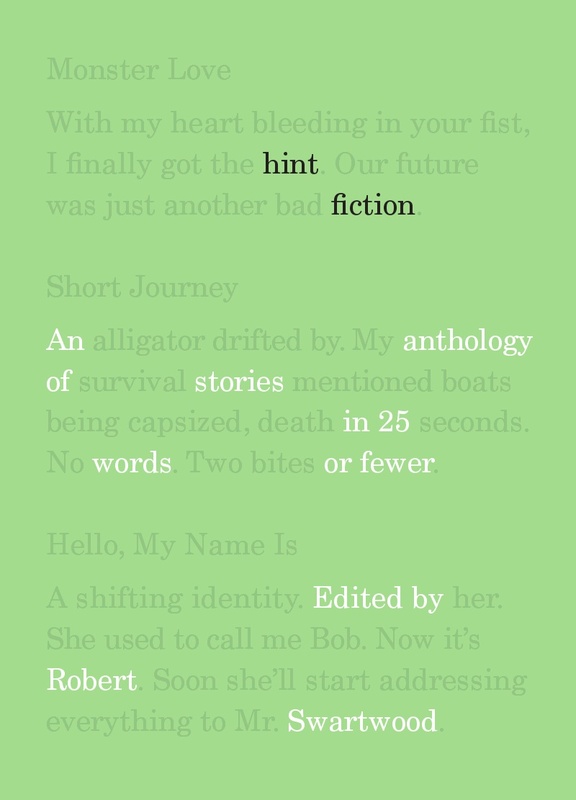 "New Hint Fiction Contest judged by Joyce Carol Oates, announced." I almost fell out of my chair. I couldn't wait to get home and start writing hint fiction. I'd already tried out six word stories how hard could it be to write one in 25 words? Well, EXTREMELY HARD. It sounds a lot easier than it looks. I'm in the process now of preparing my entry and I'm SO nervous because the writer that I look up to the most may actually read over my work! Talk about pressure! Anyway, I think I've gone on long enough. I've listed some details of the contest in case you want to check it out or enter! Writers may submit up to two entries of no more than 25 words each. For more information and official rules visit the link below! Thanks for the link. I just went over and read the entries in the comments -- so cool. There were entries posted by Steven King. Do you think it is THE Steven King? Cool! Thanks for the link...although I think it would be difficult for me to do it in 25 words of less. It's easier for me to write novels than any kind of short fiction. Good luck! By the way, I chose your blog for the Stylish Blogger Award. Not sure if you take blog awards, but you can get it here. from the firm web page and quite a few distributors.